I’m pretty sure most of us have clicked into a promising article, only to find out that the content was either 1) underwhelming; or 2) totally unrelated to the title. To be honest, in spite of being an avid consumer of articles myself, and knowing the frustration that comes with opening an article which is, briefly summed up as “Much ado about nothing”, I’m still a sucker for these traps because I’m simply too kaypoh (busybody) to not want to click on gossipy and #protips articles. This is precisely why I usually browse through the comments section before clicking on a link these days – many have taken the liberty to sum up clickbait articles in the comments section, so that readers’ times are saved, and the publishers won’t get the views they intended to capture. In fact, Twitter account @savedyouaclick has cleverly jumped on these complaints, giving short summaries to what articles really comprise of – to hilarious results. While most of us in this timezone were sleeping, Facebook released an announcement that they will be taking steps to further reduce clickbait on our Feeds. Clearly stating their goal to “show people the stories most relevant to them [by] ranking stories so that what’s most important to each person shows up highest in their News Feeds”. In a bid to promote “authentic communication [and] stories” and also respond to users’ feedback, the Facebook team has reiterated in their note that they are working to understand, and thus reduce clickbait stories on Feeds. 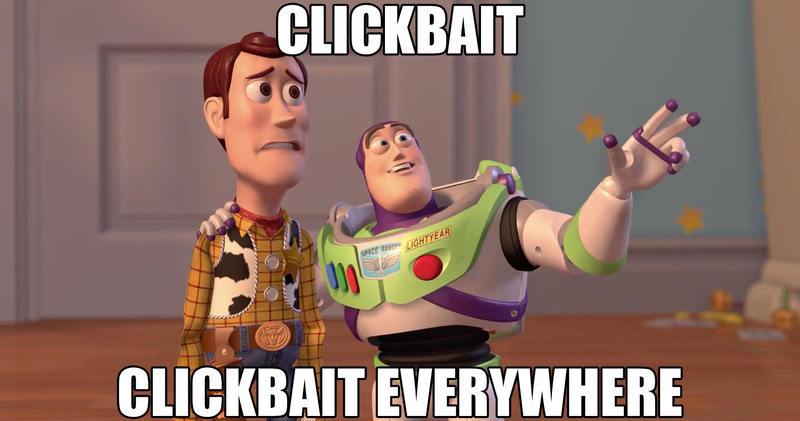 The move to reduce clickbait is nothing new, and back in 2014, they had updated the News Feed to address this. Looking at the length of time people spent reading the article away from Facebook. The longer time one spends reading an article = a valuable article; the shorter time one spends on it = a low quality OR possibly clickbait article. Looking at ratio of clicks vs. Likes, Shares and Discussions.A high clickthrough with a low translation to Likes, comments or Shares = a mediocre OR possibly clickbait article. Regardless, the team realised that it still wasn’t making some Pages stop the bad habit, so they’re implementing a new system which identifies phrases commonly used in clickbait headlines. Some examples they gave were “You’ll Never Believe Who Tripped and Fell on the Red Carpet…” and “Apples Are Actually Bad For You?!”. The system would then work like email spam filters, identifying the commonly used clickbait phrases, and then the posts and Pages that these content came from. To somewhat ‘punish’ the perpetrators which constantly rely on giving false hope to readers, links from those Pages would then be made to appear lower in users’ Feeds. However, this doesn’t mean that those Pages are blacklisted forever – there is still a chance for redemption if they stop posting such headlines. While Facebook stated that they “anticipate that most Pages won’t see any significant changes to their distribution”, it comes as a reminder to content producers that even though clickbait titles will get them the clicks they desire initially, these tactics do not work in the long run. It’s a tough fight for eyeballs in this social media age, but with that also comes an even greater need to be responsible in what one posts online. Titles should seek to inform YET entice. It would definitely take more effort on producers’ parts to come up with that fine balance, but it is definitely worth it – for both readers and themselves.